Beginning at the age of 12 in motocross, Johnny Greaves has won races and championships in every level of competition. At 23, he switched to four wheels and soon earned success while buggy racing in SCORE off-road desert and SODA short-course off-road series (the precursor to Championship Off Road Racing – CORR) and the current TORC Series. 2017 Johnny won 3 Pro4 races, came in 2nd in 7 races. He podiumed in all but 1 race. Podiumed in 10 out of 13 races in 2016 with 4 wins, 4 2nd place, and 2 3rd place. In the early ’90s, Greaves, from the Green Bay Wisconsin area, earned multiple buggy-class championships, including an incredible “double” in 1992 with titles in Class 1-1600 and Class 9. That same year, Greaves took his first steps in compact trucks by racing select events in Class 7s. In 1993, he began racing trucks exclusively and debuted a Toyota SR-5. With his energies devoted full-time to truck racing, Greaves finished the season in the winner’s circle at the final two events of the SODA season. From 1994 to 1996, Greaves won two championships and more than 70 percent of the races he entered. He developed a two-truck Toyota team with his closest rival, Jeff Kincaid, in 1997. Greaves/Kincaid Motorsports won 19 out of 20 races while capturing the championship (Greaves) and a second-place finish (Kincaid) in both the SODA Series and CORR Winter Series. The 1998 and 1999 seasons were a continuation of the Greaves/Kincaid team’s incredible success as they dominated the CORR Pro-Lite compact truck class in their Toyota Tacomas. In 1998, Greaves was victorious in 10 of 16 races and upstaged himself in 1999 with 11 wins, capturing his third Pro-Lite championship. In 2000, Greaves made the move to full-size trucks with a two-wheel-drive Pro-2 Class Toyota Tundra. Season highlights included a win at the finale in Topeka, KS, and the top Pro-2 truck (third overall with the Pro-4s) in the Borg-Warner Cup at Crandon. Greaves made another jump in 2001 up to the Pro-4 (full-size, 4WD) class with great results. His three victories were second most in the class, placing him third overall in his first season. He is the only racer in series history to have race wins in each of the three professional classes. Greaves reached another milestone in 2002 with a Pro-4 championship in his Forest County Potawatomi Toyota Tundra 4×4 and led the class with three victories. In 2003, Greaves earned four wins, to tie for the division lead. He also had nine top-five finishes in 13 races to finish fourth overall in the Pro-4 division. In 2004, Greaves earned four wins and had 11 top-five finishes in 14 races to finish fifth overall in the Pro-4 division. Greaves dominated the big money off-road racing action in 2004 by winning the BorgWarner Shootout at Crandon International Off-Road Raceway for the $100,000 BorgWarner Cup. Greave’s win was the first for Toyota. In 2003, Greaves won the Potawatomi Governor’s Cup – an event similar to the Shootout. In 2005, Greaves started the season slow in his Toyota Pro-4, but ended with an astounding finish, taking the championship with an incredible seven consecutive win rally! This win streak gave Greaves the all-time record for consecutive wins for CORR, and additionally brought Greaves’ total win record up to 44, giving him the record for most all-time victories for CORR. Greaves winning season also captured the manufacturer points, giving Toyota the Manufacturer Cup Award for Pro-4, for the first time, and as a finale, Greaves claimed the Precision Gear 2005 Driver of the Year award! Johnny successfully defended his 2005 title in 2006 for the Forest County Potawatomi, Toyota and BF Goodrich team and was crowned Lucas Oil CORR Series Champion for the 5th time. He came from the back of the pack in the final CORR round to first to claim his 7th win of the season and win the points battle by a comfortable margin of 28 points. Johnny Greaves now has a total of 51 CORR Series race victories since 1998 and leads the way in that category, giving him the title of the “winningest driver in off-road short-course racing”. He has won 15 times over the last two seasons—seven wins more than anyone else, including his next closest rival who has 8 victories over the same two seasons. He was named the 2006 Driver of the Year. With the establishment of the mid-west Lucas Oil, World Series Off-Road Racing series, the 2007 season found Greaves Motorsports travelling back and forth across the country to run two series. 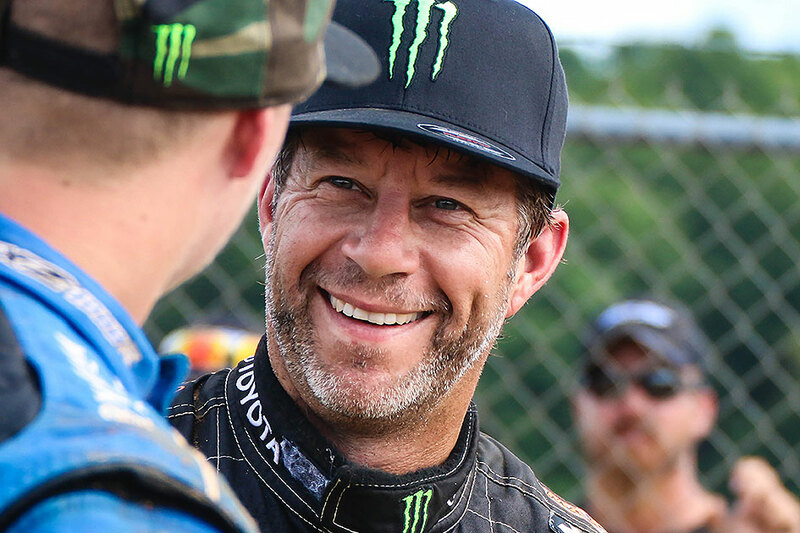 Johnny once again established himself as a dominate force in the short-course off-road racing scene by winning his 6th career championship, taking the Pro 4×4 title in the inaugural WSORR series for team Monster Energy Potawatomi Toyota. It was also his third title in three straight years with a BorgWarner cup and a Potawatomi Chairman’s Cup victory as well. In CORR, Johnny had his ups and downs but established himself as the man to beat and clearly a fan favorite. Johnny started the season off great with back-to-back wins on the opening weekend, taking first place in the first Jason Baldwin Memorial Cup race broadcast on NBC Sports. At the Fairplex in Pomona, CA, Johnny took the top spot followed by Rick Huseman as Toyota went 1 and 2. This was Johnny’s 55th career CORR win. Johnny finished the 2007 season with wins in Antelope Valley, Chula Vista, Dallas and Primm. Johnny won the cup race in Dallas after a miracle motor change between races by crew chief, Curt Greaves, and the Monster Energy Potawatomi Toyota/TRD team. Johnny Greaves finished the CORR points race in 4th place. In 2008 Greaves Motorsports took their racing program to another level by adding a second truck to the mix in the Pro 2 class. The season proved to be a challenge for the Monster Energy Potawatomi Toyota BFG team but the team made significant progress with several podium finishes and a win in Primm, NV – 13 top five finishes. While Greaves did not run the entire WSORR season, he did participate in the races at Crandon International Raceway picking up his 70th career off-road win on Labor Day weekend. One of his worst crashes of his career came at Pomona, flipping nearly 8 times, sending him to the hospital, and making him unable to race in the Sunday race. Johnny and his team proved their resilience by coming back and winning at Crandon two weeks later after having to completely rebuild the truck only to have it wrecked again during the Borg-Warner Cup race. The team went to work once again to have the truck ready for the CORR race in Chula Vista the next weekend. Johnny completed an amazing comeback by landing on the podium in 3 of the 4 races in Chula Vista. With the demise of CORR, Johnny and a group of pro drivers formed the Professional Drivers Group (PDG). This group organized with the goal of developing a united, short-course off-road racing series. Out of that emerged The Off Road Championship Series (TORC) headed up by supercross Legend, Ricky Johnson and Johnny’s agent, Mitch Covington. The 2009 inaugural season remarkably came together in a very short time with a great TV package and top national venues. Before the season began, a great opportunity presented itself to Johnny Greave Motorsports, with supercross superstar Jeremy McGrath joining the team to drive Johnny’s PRO 2WD class Toyota. Johnny’s 2009 TORC Series PRO 4X4 season was filled with near misses, spectacular crashes, and exciting victories. He earned his first win in the second race weekend at Perris Auto Speedway in Perris, Calif. He managed a weekend sweet at the Bark River International Raceway in rounds 7 and 8. Johnny finished the season in a respectable 4th place in points. In the off season, Monster Energy/Toyota/BFG pulled together to attempt a record jump in a 4-wheeled vehicle. Johnny not only beat the record—he shattered it by jumping to a new World Record: 301 feet! Johnny tore into the 2010 TORC Series season with a vengeance on Father’s Day weekend by winning the opening round at Crandon International Off-road Raceway. His son, CJ, also took the top podium spot in the Super Buggy for a great Father/Son victory sweep. Johnny followed his Crandon success with back-to-back victories in Bark River. He also earned the Oakley Bomb award for the fastest lap in both races and finished the season with an impressive 6 awards. He also won at Chicagoland’s Route 66 track in TORC’s first trip to the windy city. Greaves finished the season with 5 wins and 8 podiums to clinch another Pro 4 off-road championship. CJ won the Super Buggy championship to complete the first short-course father/son championship combination. After a sluggish start to the 2011 TORC season at Red Bud MX part, Johnny stormed into Crandon International Raceway for rounds 2 and 3 with a first place finish, an Oakley Bomb Award, breaking the track lap record and giving Maxxis Tires its first Pro-4 win. He followed that up with a second place. The season was filled with epic battles between Johnny, the defending Pro-4 champ, and Ricky Johnson, the defending Pro-2 champ including a wild one at Charlotte, where tempers flared and the tempo for the season was set. Johnny clung to a narrow points lead all the way up to the final weekend of racing. A second place finish put Johnny and Ricky dead even going into the final race. A back-to-back championship would elude Johnny due to mechanical problems and he would settle for a hard fought runner up position. 2011 came to a tragic end when friend and teammate Rick Huseman and his brother Jeff were tragically killed in a plane crash on October 16, 2011. The Huseman’s were honored in the 2012 season finale with a race in Lancaster, California, the place where Rick got his first win. Johnny ended up driving Rick Huseman’s number 36 Monster Energy Toyota in the race due to mechanical problems with his truck during qualifying. The Huseman’s allowed Johnny to use Rick’s truck that had not been in a race for more than a year-and-a-half. Even though Johnny did not race hard and stayed in the back of the pack for the race, it allowed him to salvage valuable points. 2012 marked the beginning of a new era for Johnny Greaves Motorsports as CJ Greaves, Johnny’s teenaged son, took the wheel of the Monster Energy/Toyota/Maxxis Tire Pro 2WD class machine for the first time. CJ would also compete in the Pro Light class, hoping to improve on his 6th place finish in the standings last year. Johnny had one of those years that raises its ugly head from time to time when it seems like “what could go wrong did go wrong.” He was a contender in every race and in spite of the seemingly bad luck; Johnny ended the season with 3 wins, 5 podiums, 11 top 5’s, finished 3rd in the points and topped it off with 5 Oakley Bomb Awards. 2013: Johnny entered the 2013 TORC season with a tremendous amount of enthusiasm and anticipation. He saw his team gain a lot of experience in 2012 and develop into a solid, cohesive team that would prove to be crucial over the course of the season as they entered trucks in all 3 pro classes. Johnny took home his 10th professional championship by winning the number one spot in Pro-4 class by 20 points. The season consisted of 11 podiums including 6 wins, 3 second place trophies, and a pair of 3rd place finishes. He also collected 5 Oakley Bomb awards for pulling fastest lap times. The season included dominating performances in Bark River where Johnny and CJ collected 6 podiums between them and 7 for 8 podiums in the July Crandon races. One of the most memorable races of the season was the AMSOIL Cup race at Crandon International Raceway on Labor Day weekend. With CJ racing in the Pro 2WD class and Johnny in the Pro 4×4 class, the two pulled off an epic race that put CJ and Johnny in a head-to-head battle to the finish line. CJ beat his dad to the finish line in a photo finish to become the youngest driver to win the Pro-4/Pro-2 shootout. 2014: In 2014, Johnny Greaves put an exclamation point on his illustrious career by successfully defending his 2013 Pro 4×4 championship with a repeat performance. He took the title but watched as his son, CJ Greaves, matured into a seasoned professional driver, winning the Pro-2 class and tried his hand behind the wheel of a Pro-4. Johnny podiumed in all but 2 races, including a 2nd place in the AMSOIL Cup race. 2014 was a breakout year for CJ Greaves as he claimed his first Pro-2 Championship. He pulled off another historical accomplishment by earning podiums in all three pro classes in a single day. It happened on the final day of racing at Crandon International raceway. In only his 2nd Pro-4 race, he took a 3rd place. He followed that with a 2nd place Pro-2 finish and then, took a commanding victory in Pro Light class. 2015: Johnny G Motorsports continued to run 3 trucks in the TORC Series, but this year, it would be Johnny in the familiar Pro-4 and CJ also moving up into the Pro-4 ranks as well as seeking to defend his 2014 Pro-2 championship. Johnny was in the unique position of cheering on CJ, while at the same time working hard to defend his 2014 Pro-4 championship. Johnny finished the year in the runner up position behind CJ. He added another FC Potawatomi Cup to his shelf. CJ’s season was nothing short of remarkable. He took his second Pro-2 championship and became the first TORC driver to win championships in both Pro-2 and Pro-4 in the same year. CJ podiumed in all but 1 race including an incredible 8 wins and an exciting season finale AMSOIL Cup win. 2016: With Johnny at the helm of a multi-vehicle racing team, Greaves Motorsports continued to go from victory to victory in its ever evolving racing program. With son CJ taking a lot of the spotlight, Johnny continued to build on his legendary career. He finished the Pro4 season just 4 points behind CJ which came down to the final racing weekend in Crandon. Johnny won the Saturday race, but CJ came in a close 2nd to nudge Johnny out of the championship. CJ also took the Pro2 title in three-peat fashion. Johnny opened and closed the season with Pro4 wins and sandwiched 9 other podiums between them. At the close of 2016, Greaves motorsports added another class to their racing lineup: Monster Energy Yamaha Racing/Maxxis Tire/Yamalube YXZ 1000R. 2017: Greaves Motorsports put together another successful season, adding multiple Yamaha UTV’s to their program. With TORC rule changes, the team moved away from Pro2 and concentrated on Pro4’s and UTV’s. Johnny and CJ continued to dominate the Pro4 class, winning all but 2 races in the season. Johnny won 3 and came in 2nd in 7 races. He also won the prestigious Forest County Potawatomi Cup race with CJ coming in 2nd. Yamaha teammates Rodney Van Eperen and Jake Lunderby had break out seasons with Van Eperen barely missing the Pro Mod championship by a mere 8 points. Jake ended the season 3rd in points. Johnny had to finish the season out for Rodney due to a terrible motocross accident just before the season finale in which Johnny finished 2nd.